You do -NOT- want to miss this meeting! Roger Breedlove is generously donating several of his rods and a half dozen reels to the club. Need a fly rod or reel, or both? Here's your chance to get one at a great bargain - and raise a few bucks for the club. Also, fall fishing is almost here and we'll talk about where to go. This month Dan Fromme will be leading us in tying the Red Annelid. Created by John Gordon, this fly is a staple for fishing the San Juan River in New Mexico. 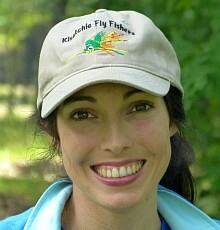 But it's also a great fly for all western trout waters and even for bream here at home. It imitates a tiny worm, but could also imitate certain midge larvae. Bring your fly tying tools. If none, the club has a few sets for use during these sessions. Materials are provided. As always, you do NOT need to be a club member to attend. Beginners are welcome! 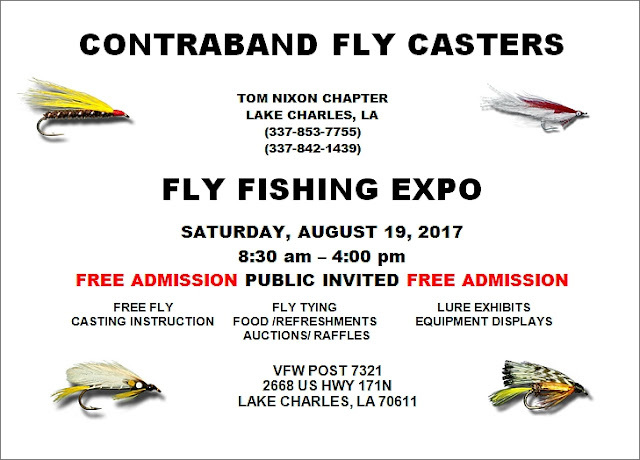 On Saturday, August 19th our friends in the Lake Charles club will hold their annual fly fishing expo, or conclave. The event is free and open to the public. We encourage club members and other fly anglers in central Louisiana to attend, to meet other fly anglers and learn more about various aspects of our sport.